The sun is slowly sinking behind Oxnard’s Del Sol Stadium and the hometown Guerreros have taken the field, zipping through their pregame soccer warm-ups. A boom-ch-boom-chick reggaeton beat bumps through the loudspeakers, and the souvenir shop – a table set outside the players’ locker room – is open for business, selling beanies and jerseys and long soccer scarves. In the stands, the black-and-green colors of the hometown team dominate the fashion choices of a small but loyal fan base that has arrived this Saturday evening to watch the Guerreros take on an undefeated club from Phoenix, Arizona. But there’s something distinctly Kingsmen purple-and-gold at work here too. 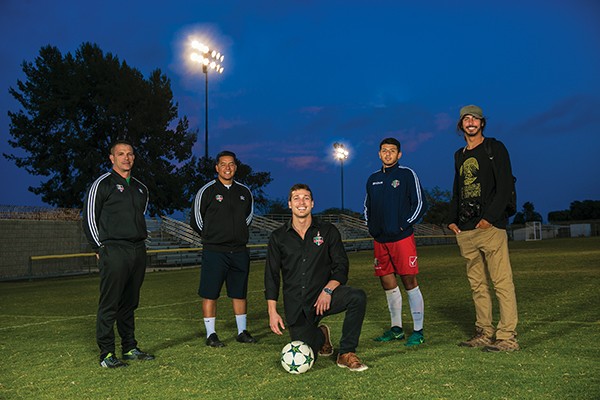 A Cal Lutheran undercurrent propels this first-ever push to establish a professional soccer presence in the already soccer-crazed city of Oxnard. The founder and owner of the Guerreros fútbol club is a Cal Lutheran grad, as is the general manager. A couple of the players are CLU alums, and a host of staff and interns either graduated from Cal Lutheran or are working toward degrees. It’s like Cal Lutheran west at Del Sol Stadium. And that goes right down to the philosophy that guides the formation and development of a club whose mission it is to put local soccer on the map while building an institution that will serve as a source of civic pride. “Community building is a huge part of what we are about,” said Oxnard native Salvador Orozco, who as the Guerreros’ PR director serves as the public face for the club. Before attending Cal Lutheran and playing a couple seasons on the Kingsmen soccer squad, Orozco played plenty of soccer around these parts, both at the club level and as a standout at Channel Islands High School. He knows too well the depth of soccer talent that has long existed on the Oxnard Plain and across Ventura County, and he knows that too often that talent has either been overlooked or squandered because players have lacked opportunities to compete at a higher level. Now come the Guerreros, a first-year expansion club looking to make a little noise in the Southwest Conference of the National Premier Soccer League. That’s exactly what Ty Otto ‘15 had in mind when he launched the club late last year. A marketing communication major at Cal Lutheran, Otto flirted with various ventures upon graduation, but soccer, his first love, kept calling. Like many fútbol enthusiasts, Otto began playing at an early age, first in AYSO, then with a high-powered prep team at the Dunn School in Los Olivos, and most recently with a recreational soccer club he started at Cal Lutheran. But perhaps unlike his soccer-playing peers, while he harbored dreams of playing at the professional level, he also developed at an early age the idea of one day starting his own soccer team. A quadruple ligament tear ended his big league soccer dreams. But a blog post by tech entrepreneur Dennis Crowley, co-founder of the Foursquare “check in” app, put Otto’s other dream within reach. The blog entry provided a roadmap for launching a professional soccer team, something Crowley did in 2015 in New York’s Hudson Valley. Late last year, Otto decided to follow suit, tackling every phase of building the Guerreros from the ground up. Because NPSL approval didn’t come until November of last year, Otto essentially had four months to pull together the whole project in time for the Guerreros’ first game in March. “It was pretty hectic there for a while,” said Guerreros general manager Robb Bolton ’96, another former Kingsmen player and one of Otto’s first hires. Since graduating from Cal Lutheran, Bolton had accumulated extensive experience with business startups revolving around athletic training, sports medicine and coaching. He was able to put that experience to good use, spearheading the Guerreros’ push to change the soccer culture in the Oxnard area by providing good mentorship and direction to local players looking to make the often-bumpy transition from amateur play to the professional ranks. Tapping proceeds from some profitable post-graduation business ventures, Otto quickly assembled a management team, which got busy hiring coaches, holding tryouts and signing players. They found sponsors, designed a logo, produced jerseys, launched a merchandising line and created a website. Otto said the hardest part of the whole process was finding a place to play. The team did not secure Del Sol Stadium until about 10 days before the Guerreros’ first home game on March 25. And somewhere along the line, even without meaning to do so, Otto said he began to tap Cal Lutheran connections to get his new venture off the ground. Indeed, a large part of what the Guerreros are about dovetails with the university’s community- and service-oriented mission. Already the Guerreros have improved the bathrooms and locker rooms at Del Sol Stadium, and have laid plans to improve stadium seating and install a public address system. They’ve invited youth soccer teams to watch games and practices, and have recruited young players to shag balls at home games. Yes, the formation of the Oxnard club is about mining local soccer talent, Otto said. But it’s also about contributing to the community and shining a positive light on an area too often the focus of negative attention. ALL THE LOVE THE GUERREROS ARE GIVING, THEY’RE GETTING IN RETURN. A community meet-and-greet in early spring at Oxnard’s Plaza Park drew dozens of fans, who took photos with players and collected autographs. Team members handed out complimentary game tickets and ran through soccer drills with those in attendance. A month later, players, coaches and staff were invited to Oxnard City Hall, where the Guerreros were proclaimed the city’s official professional soccer team. “Obviously, whenever someone puts so much effort into an undertaking that is meant to show what is positive about Oxnard, the city is going to get behind it 100 percent,” said Oxnard Mayor Tim Flynn, who attended the Guerreros’ first home game and was impressed by the high caliber of play on the field and the outpouring of community support in the stands. On the field, the Guerreros have done their share of winning. They won their first home game of the season, and in their sixth match they racked up their biggest win of the year, an 11-1 rout of fellow expansion squad City of Angels FC. But it’s not easy being an expansion team. Despite hard play at every turn, by midseason the Guerreros had lost more games than they had won, including a tough defeat at the hands of FC Arizona. NOT THAT IT MATTERED MUCH TO THOSEIN ATTENDANCE. The ball boys were plucked from local schools, invited by coaches to come out and be part of the team. Halftime was highlighted by a goal-shooting contest, where kids were invited onto the field to compete for Guerrero decals and tickets to the next home game. In the stands the same evening was Raul Yepez ’13, a Guerreros player who in many ways embodies what this upstart venture is all about. Since arriving in Oxnard with his family from Mexico at the age of 10, Yepez has been a soccer star. He was a standout at Pacifica High School, and turned down offers to go pro when he enrolled at Cal Lutheran. He led the Kingsmen in goals for two seasons and twice earned first team All-SCIAC honors. He graduated with a double major in business and accounting, and then went to work shouldering the responsibilities of adulthood and family. His competitive soccer career was all but over when the Guerreros came to town. Yepez tried out for the team and once again has emerged as a star player, although he has been plagued by injuries this season. That is how he found himself on the sidelines this evening, supporting his teammates instead of barreling into the thick of the action. For Yepez, who fittingly scored the club’s first competitive goal, the Guerreros represents perhaps one last shot at soccer glory. But he also knows that what’s happening on this field and in this hometown stadium is about more than his own personal soccer journey. “Right now, in our first season, it’s not all about winning,” said Yepez, who knows the local soccer landscape better than most and knows just how valuable this venture can be.